This was delicious, and I think would taste fabulous using leftover Thanksgiving Day turkey. With a nice side of cornbread… yum. If you make it with leftover turkey, just stir the diced, cooked meat into the stew about ten minutes before serving. And if you haven’t entered to win a copy of the now sold-out cookbook from Gooseberry Patch, Slow-Cooker Christmas Favorites hop to it! I’ve got a copy to give away, and it ends soon! In a slow cooker, stir together undrained tomatoes and remaining ingredients except chicken and garnish. Lay chicken on top. Cover and cook on low setting for 6-8 hours, or on high setting 2-4 hours. Shortly before serving, remove chicken and shred with 2 forks. 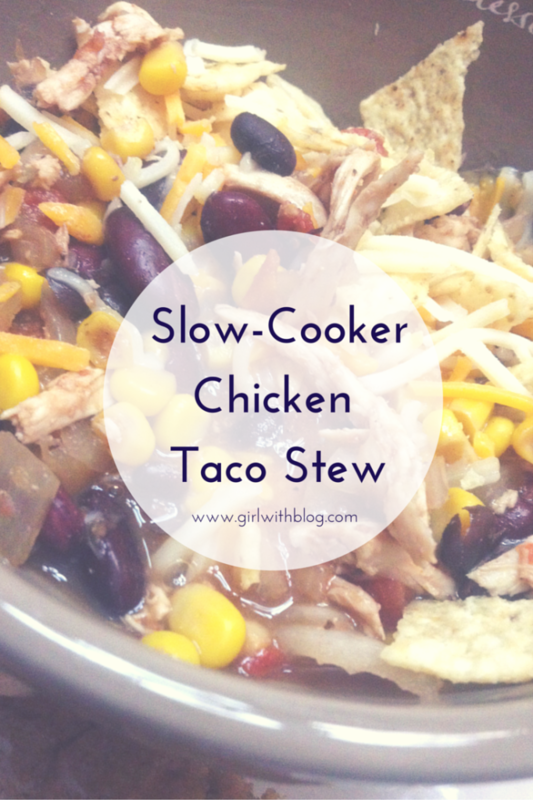 Return to slow cooker. Serve portions garnished with cheese, sour cream, guacamole and tortilla chips. Makes 4-6 servings.